Reasonable price, quick service, and good results. This was the first time I used Battres Construction. They did a complete remodel of my home. I had four bids initially, and their price was the lowest. Their crew arrived on time, addressed any concerns that arose, and were very efficient. Their crew worked well together, and did a good job. If I had another house to remodel, I would use them again. The people from Battres Construction were wonderful; they couldn't have been any nicer! They were very meticulous, professional, courteous, very very neat and clean, and were always here on time. They remodeled our bathroom and painted the kitchen cabinets, TV cabinet, and mantle. We were especially impressed with this crew- Ray was the supervisor, and Brandon was the tile person. We just love them! I was going to adopt them, I liked them so much. They were doing work all over the house, but you wouldn't even know they had been there. They would sweep and vacuum every day before they left- even the plastic covers on the stairs! They were very very neat, and we were more than pleased. They worked on weekends, and they came in every day from 7 am to 6 pm. They never even stopped for a lunch break, and it was hot in that bathroom! We couldn't be happier; everything is absolutely beautiful. My daughter said the bathroom looks like it's out of a 5-star hotel. The prices were very reasonable. Compared to the other contractors we looked at, Battres Construction was right in the middle, but the prices were really good for the quality we received. Contracting work can be scary, because you're investing a lot of money and there are so many things that can go wrong. Everyone has heard horror stories, but we had none with this company, and especially with this crew. The quality of the work was unbelievable, and we would highly recommend them! Battres Construction helped us with a full house renovation. We took down almost everything from the house. We took down walls and added new features. For example, we put in a new shower in a bathroom that only had one toilet, expanded the master bathroom, did some aesthetic work in terms of paint and flooring; we took out a wall for the kitchen, re-piped, and put in new electrical system. During the whole process they were very responsive when we had any questions or concerns. I never felt they wanted to increase or make more money off of us. The opinions they gave, I believe it was in our best interest. I don't think I could rate them any higher. They met and exceeded our expectations. We would use them again! "They were as good as you can be! It was a lot of work! They tore down the back of my house and rebuilt the whole thing. I felt that everything done on their part was good. As far as my experience with them goes, they were as good if not better than anybody. They addressed every problem and issue that came up. They were great to work with." "I highly recommend Battres construction to work on any remodeling project. BC quality of work is second to none. I haven't see such a group of people work together like a well oiled machine. They're always on time and on schedule. They're very co-operative and listen to my concerns even though I didn't have much to complain. They know what they are doing and always give me their opinions especially my project manager and my job foreman. To have them work on my remodeling project is the best move I made. I give my at most thanks to Israel Battres and to his crew. I consider them a part of my family forever. Thanks guys for a job well done. You have my appreciation and utmost gratitude for fulfilling my family's wish to remodel our home. Again thank you very much and you're always welcome to our home." "The results were excellent. I received a complete home remodel from BC Home Builders and they were really on top of things. Israel, the owner, was very informative about the entire process and kept us up to date every step of the way. It took them five months to complete the remodel and they did an amazing job. I would highly recommend them because they're very organized, clean, thorough and customer service is huge to them. The remodel couldn't have been better and I'm really happy I chose BC Home Builders to make my home look beautiful!" "What I really liked about the guys over at BC Home Builders is that they were very timely. They kept on budget as well which was really nice for my wallet. The workers were very friendly and you could tell that they knew what they were doing. Any follow ups that I requested they got done in a very timely manner which I appreciated. It was just an overall very good experience and I would definitely use their services again." "Absolutely great. Timely, communicative, great company to work with. BC Home Builders are a great company to work with, specially since they are taring down your house, considering that, it was a really good experience. This was my first time using them, I heard about them from the TV show Flip or Flop and they were very good. I mean, they show up when they say they are going to show up, if they are going to be late they call and tell you that they are going to be late, they keep their appointments and always reply to your e-mails, just a great company to work with." "BC Home Builders did a really good job. We used BC Home Builders for a very big job. They were very considerate and easy to schedule. I liked that they had good communication, and that I knew that they were doing a good quality of work. I never questioned how the job was being done because I knew that they were doing it correctly." "I had seen the advertisement for BC Home Builders on the television. They did a lot of work for us. Remodeled our kitchen and installed new appliances. They replaced asphalt shingles in the ceiling and did some roofing. They also did some plumbing, construction, shelving, and flooring. They even installed a hot water heater. All the guys showed up on time everyday and did their job. They worked as a team at every step. Everything went very smoothly. I can't think of a single thing they could do better. I would recommend them to anyone. I would use them again." "Just wonderful people. The workers from BC Home Builders are well-mannered. They're hard workers and they cleaned up after themselves every day. We hired them to remodel the kitchen, put in new flooring throughout the house and put in a new electrical panel. It was a big job." "We originally hired BC Home Builders to gut and update an upstairs bathroom. They ended up doing so much other stuff for us. Every other little job they did for us was documented and priced on an invoice for us to approve, so we knew exactly what we were paying for and the cost for each. There were no surprises when it came to pay the bill. They communicated so well with us. There were some rips in our screens from the cats that BC fixed for us, we didn't even ask them to. The crew was great. They got here on time and went right to work doing an excellent job. We are already thinking of more improvements we can make for next year and BC will be the first one we call." "A great experience! BC Home Builders did a great job for our renovation and we are so pleased with the results. They renovated the entire kitchen and the living room area as well and really exceeded any expectations with their service. They were responsive, courteous, and displayed a high skill level throughout the entire project. I particularly appreciate the design assistance they gave us and how helpful they were in explaining everything that was going on. They worked efficiently and it was a great process which ended in good results. We are very happy and highly recommend BC Home Builders!" "Honest, fair price and I was able to make my own selections. I totally trusted the contractor Israel from BC Home Builders. I felt that he was an honest person and that he gave a fair price. I liked that I was able to work with them and make all my own selections and that they were able to source everything that I selected. I am going to have them come back hopefully this spring to finish the rest of the house." "I had an excellent experience with Battres Construction. They helped with a bathroom remodel. The service took about a month, from start to finish. Their team was professional and detailed. I would highly recommend them." "Respectable and high performing contractor that will meet your home construction needs! 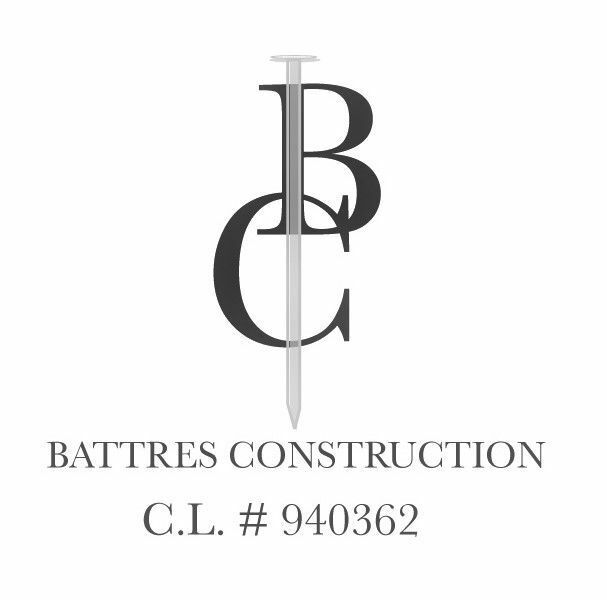 Battres Construction is a very professional contracting group. They are on time and very present to answer any questions that you have. We actually shopped around for a while and got some other quotes, and they provided the best pricing. I would definitely call them if I had another project, and would recommend them to family and friends." "Very stress-free experience! From the beginning to the end, Battres Construction did what they said they were going to do. They did a complete remodel of our condominium, and the communication was good, the quality of work was good, they left the job clean which not many contractors do. Everything got done the way we wanted!" Battres Construction remodeled my whole home. The job was started and finished on time, and within my budget. They gave it a very "modern" look, which is what we wanted. It's a rental, so we wanted something that most people would like. They were neat and quiet when they came and did their work, which I appreciated." "The absolute favorite as far as I'm concerned!! Personable, honest, trustworthy and loyal. When tarek's friend made him let you go, I was devastated! Just not the same without you!" "We hired Battres to do a full remodel at our house. They were excellent to work with. They told us the whole project would take 9 weeks, and we were back in our beautiful home within 8 weeks. Rudy Battres took personal responsibility for the entire project." "I love their work on Flip or Flop but I have really been missing Izzy on the show. Have seen him once or twice lately but hoping he's going to be on there more often. Wish I lived in Santa Ana California so they can work on house." "I like the way you fix other people's mistakes on some of the shows. I do it all the time and you always smile, you never show the exasperation I seem to feel sometimes when its me, hehe You take care of business and that's the really important part. You're also a VERY important and integral part of the "Flip or Flop" show."